Michael Wilpers is manager of performing arts at the Freer|Sackler. The Sackler’s current exhibition Nasta’liq: The Genius of Persian Calligraphy demonstrates the occasional tension between writing meant to be read and that which is valued primarily for its artistry. 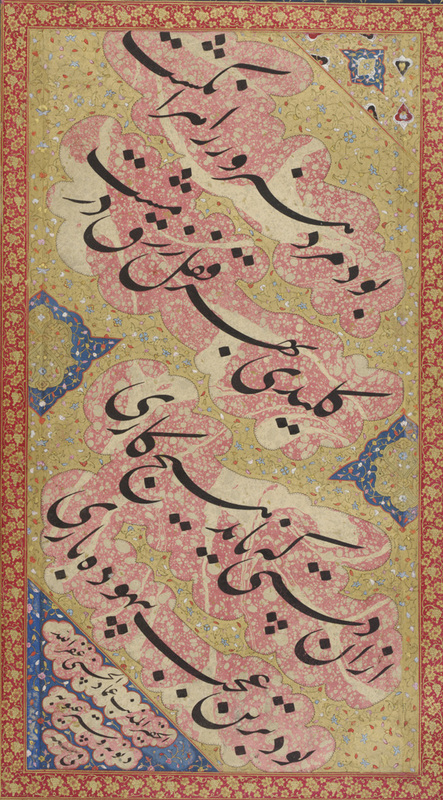 One of the more flamboyant Persian scripts on display in the exhibition is almost impossible for most viewers to read. Ornate Persian scripts have often been used in architecture and ceramics, more as decoration than signage. This kind of tension between intelligibility and artfulness has played out many times in the history of music, between songs with easily understood words and those in which lyrics are almost overwhelmed by melodic invention. A Westerner might compare the emphasis on the words in Christian congregational singing with the kind of melodic invention of a choral fugue by Johann Sebastian Bach, where sometimes the words hardly seem to matter. Perhaps no sacred music tradition is more devoted to clarity of text than the Vedic chant of Hinduism. You can hear a sample in the first track of our 2006 podcast of Gustav Holst’s “Choral Hymns from the Rig Veda,” featuring Venkatesh Sastri of the Sri Siva Vishnu Temple and recorded at the Freer Gallery. Only three pitches are used and almost every syllable gets its own note, making it easy for anyone who understands Sanskrit to follow along. At the opposite extreme of the Hindu tradition is the classical music of South India, where devotional songs (kritis) are so well known by their melodies that virtuoso musicians can perform lengthy improvisations on them without any need for words at all, confident that their audience will know them. A good example is our 2009 podcast featuring South Indian violinist L. Subramaniam performing highly elaborated variations on devotional songs by Tyagaraja (1767–1847) and his father, V. Lakshminarayana (1911–1990). Coincidentally, at the very time that Persian nasta’liq script was reaching its peak of development—the mid-sixteenth century—the Roman Catholic Church ordered that sacred music be made more understandable. Composers were to refrain from disguising the words of the liturgies in overly elaborate melodies and counterpoint. One target of these reforms was a genre of medieval plainchant that stretched out each syllable of text over a long string of notes. An excellent example can be heard in our podcast of Cappella Romana singing the fourteenth-century Invitatorium in the Greek Orthodox tradition. Simpler music—and more intelligible lyrics—were in demand again two hundred years later when Bach and Handel were writing their most complex works, a style heard in the music of their contemporary Domenico Scarletti and in our podcast of the Gulbenkian Choir. The Islamic world saw its own reforms of sacred music when orthodox legalists condemned the ornate style of Koranic recitations that appeared in the ninth to twelfth century. Melodic virtuosity is nevertheless still practiced by some specialists in Koranic recitation, while a much simpler chant style is prescribed for laypeople. In the South Asian music known as qawwali, Islamic texts are joined with praises for Sufi saints in renditions that are sometimes straightforward and at other times in a highly elaborated style. Such contrasts can be heard on our podcast by the Chisty Sufi Sama Ensemble. View our complete list of podcasts here. Nasta’liq: The Genius of Persian Poetry remains on view through May 3, 2015.